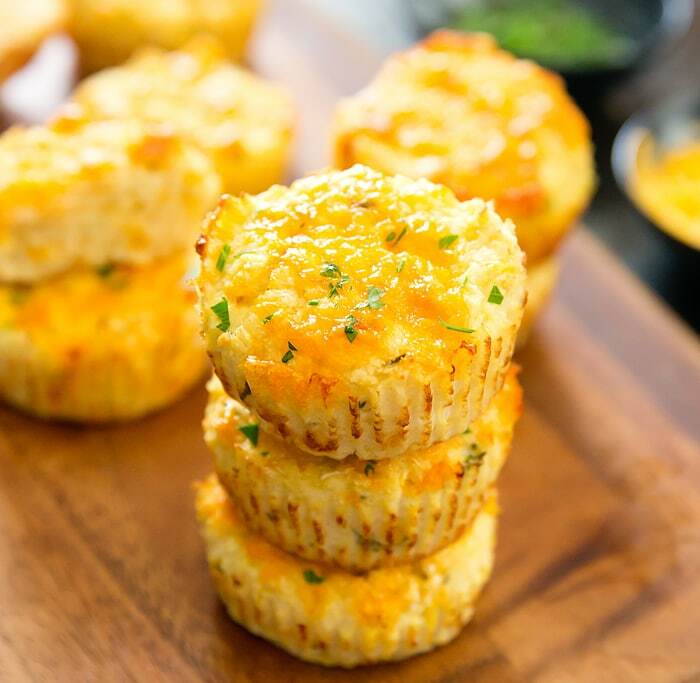 These cheesy cauliflower muffins are savory, low carb, gluten-free and delicious. Also, unlike other cauliflower recipes, you don’t need to dry out the cauliflower. These photos came out a little more dark and moody than I intended. It was a rainy day today so I had barely any light to work with. I am dreading the first weekend of November when Daylight Savings Time ends and it’ll be dark by 5 PM. I need my daylight! These muffins are so easy to make. First, you need to finely chop cauliflower florets in a food processor. 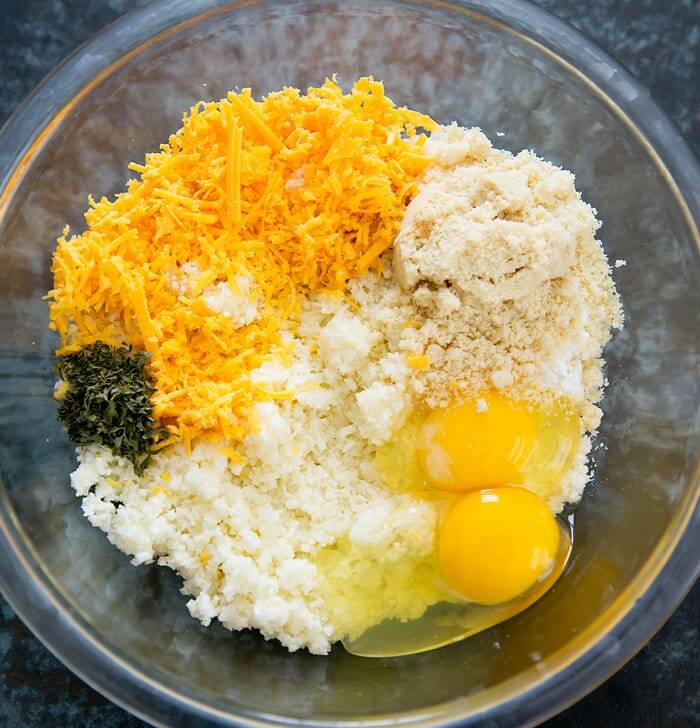 The cauliflower is combined with eggs, cheddar cheese, and seasonings. 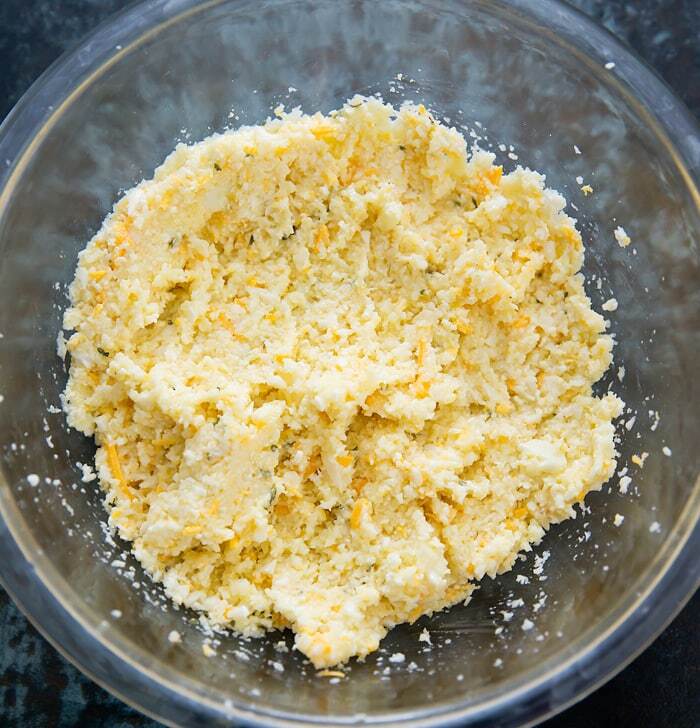 Once the cauliflower “batter” is combined it’s as simple as scooping it into a cupcake pan lined with paper liners. I like to sprinkle more cheddar cheese over the top before baking them. 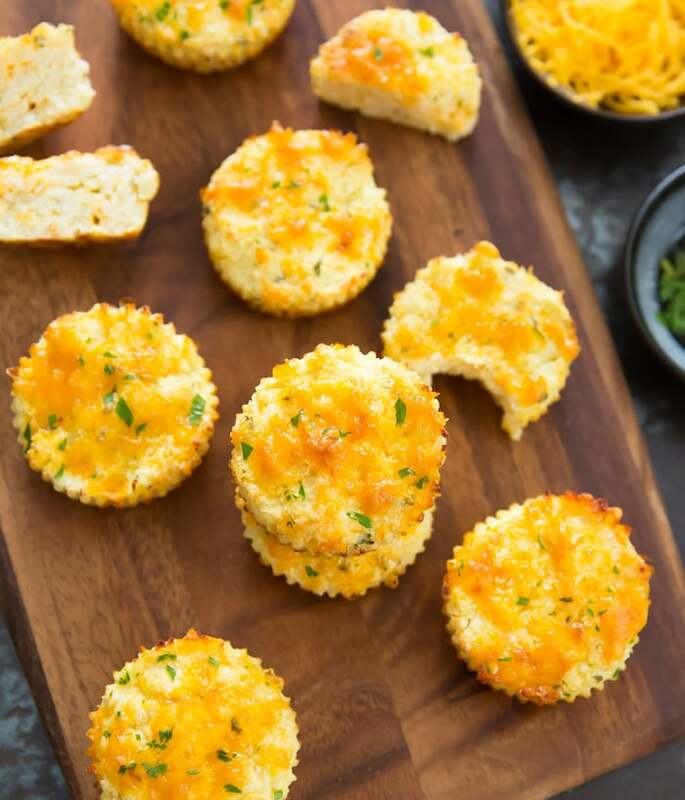 These cheesy cauliflower muffins make a good snack, appetizer, side dish, meal, etc. After all the weekend indulgences, these were a guilt-free way to start my week and keep me away from the large bag of Halloween candy calling my name. These low carb, gluten-free, savory muffins are made with cauliflower and cheese. They are great as an appetizer, snack, side dish or a quick meal. Preheat oven to 375°F. Line a cupcake/muffin pan with cupcake liners. I prefer to use parchment cupcake liners as the muffins will not stick to them at all. 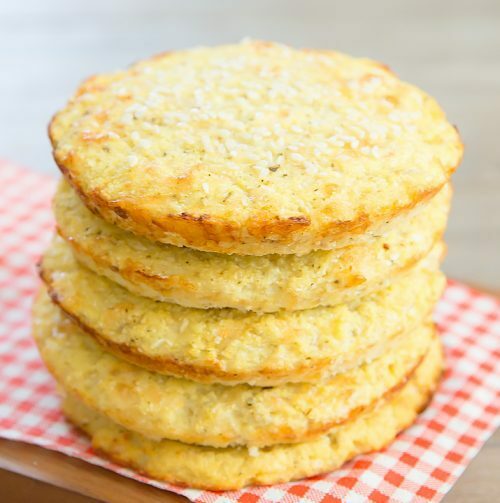 Combine cauliflower, eggs, 1/2 cup cheese, almond flour, baking powder, Italian seasoning, onion powder and garlic powder. Mix with a large spoon or spatula until smooth. Using an ice cream scooper, scoop batter into muffin cups, about 2/3 full. You should be able to fill 11 liners. 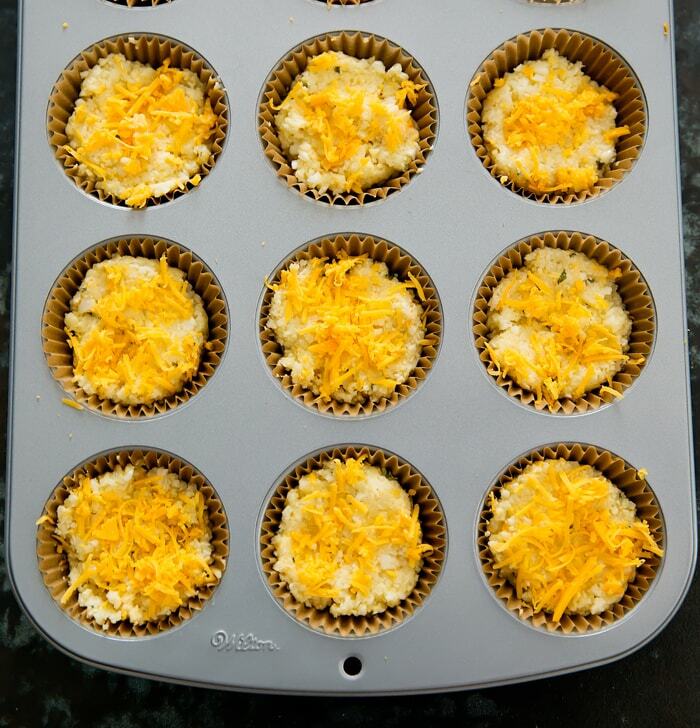 Sprinkle 1/2 cup of shredded cheese over muffins. Bake for 20-25 minutes until muffins are completely cooked and no longer wet to the touch. If desired, garnish with fresh chopped parsley before serving. 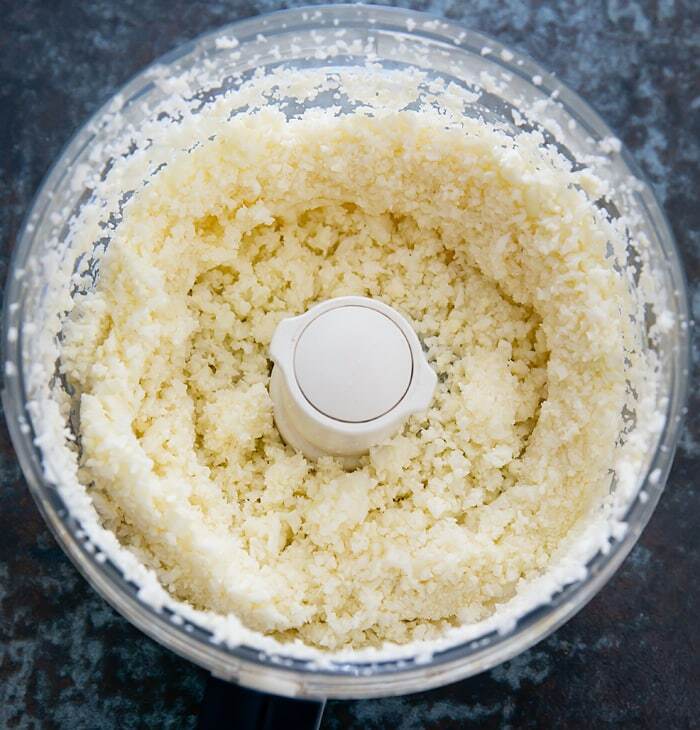 I like to use my food processor to finely chop the cauliflower. Place the florets in the processor and pulse a few times until they break down into large crumbs. I’m excited for this recipe as there’s no need to dry out the cauliflower ! And I don’t need a food processor (Trader Joes sells the pulsed fresh cauliflower now!). I’ve never tried almond flour – is this available in most markets now (ie Trader Joes?). Yes you should be able to find almond flour in the baking aisle. My son allergic to all kind of nuts. Can u substitute almond flour with plain flour? Will it taste different? I have not tried, but I think it should be fine! Wondering if you tried this and how it turned out? What do you think about adding bacon bits? Hey! Thank you for the yummy recipe! I tried this last night and I think I messed up a step. The muffins did not turn out like I hoped! I realized maybe it is because I boiled the cauliflower to soften it for mixing and it wasn’t dry enough for prepping. How did you prepare your cauliflower for pulsing? Hi Bre. I’m sorry they didn’t turn out right. The cauliflower is supposed to be raw when pulsed. The boiling would make it too wet. Hahaha, so I made this today and it turned out great. Joined Instagram to share about it but then realized Instagram is only for smart phones! I never knew that. I have a cell phone but it is not a smart phone. Live and learn! I followed your recipe except that I added more onion and garlic powder and half a teaspoon salt. As a diabetic, I am glad to have something that makes me feel like I am “cheating” and having baked goods! oh no, sorry about Instagram! I’d love to see a photo. You can email me a picture or if you are on facebook, you can post one to my facebook page. I’m glad you enjoyed these though! Thease look great! I’m going to try them today. I’m trying to count carbs and track calories. I wonder how thease would rate. I think the kids will even like them.? I hope you and the kids will enjoy! Any idea on the calories, carbs, fat, etc on these? 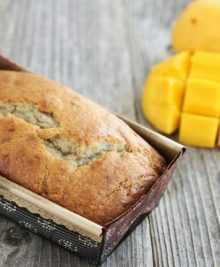 It is possible to use coconut flour instead of almond flour? i have not tried, but I think that should be okay! 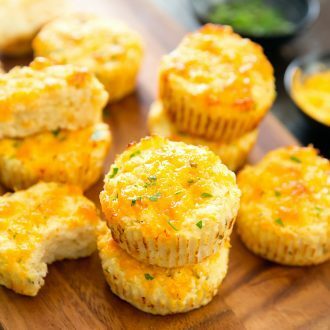 Would there be a way to make these delicious cauliflower muffins without eggs? This is what i was searching, You gave perfect recipe and I am Professional Cook your recipe helped a lot. I’m not sure. I haven’t tried pulsing cauliflower in a blender before. I would only worry that it would pulse it too much. sorry I do not yet have the nutritional information for this recipe. I veganized this recipe by using Follow Your Heart brand vegan egg and dairy free parmesan shreds. I baked them for the full 25 minutes and did not use muffin tin liners, just some oil spray in the tin. They turned out moist and cheesy-almost like little omelette cups. Next time I will bake them a little longer to see if it reduces the water content and produces a more bready consistency. Delicious and the way I prepared them is 105 calories, 4.8 fat grams, and 13 carbs. Thanks for sharing! When measuring the cauliflower, how tightly do you pack the cup – just spoon it in, or pack it down somewhat? We’re about to try this recipe for the first time. I just spoon it in. Hope it turns out well for you! Would frozen cauliflower “rice” work for this recipe? If so, would you just defrost or defrost and pat dry any moisture. I’m excited to make these for a grain free muffin option for my lil guy who prefers cheesy and savory over sweet. ???? Thanks! I have not tried but I believe it should work. You should probably defrost and pat dry first. 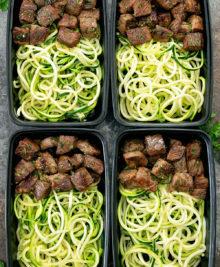 I made these tonight for my boyfriend who keeps jumping on and off the low carb wagon. I used the riced cauliflower by Green Giant. I think next batch I’ll thaw and let it dry out a bit, maybe mash it up a bit more. My muffins are not so much muffins as they are cheesy, cauliflower quiche cups. They taste great though. Will definitely try again with some adjustments. Thanks! I’ve only used fresh cauliflower for these. I think it can work with frozen, but you definitely need to thaw and pat dry since frozen has a lot more moisture. Thanks for the recipe! Flavour was great and they were easy to make. I still found them a little moist though so next time I’ll squeeze out some of the liquid. Love these! I added smoked uncured beef sausage and half a teaspoon of salt. Taste is great! I’m betting them cook a little longer for the inside to dry a bit longer. Thank you for sharing! yum, love the addition of sausage! Has anyone tried these with parmesan cheese instead of cheddar for a lectin-free option? Very GOOD!!!!! My daughter and friends fight over them!!!!!! This time I used frozen pop corned cauliflower for easy-ness. Already mixed ingredients before thinking about the frozen-ness. Threw in microwave for couple minutes and they were fine but not the typical awesome-ness. Always thaw out and wring out moisture. ????? Try this with broccoli also!!!! Must get as much moisture out for it to work great though!!! thanks for sharing! So glad your daughter and friends like them! 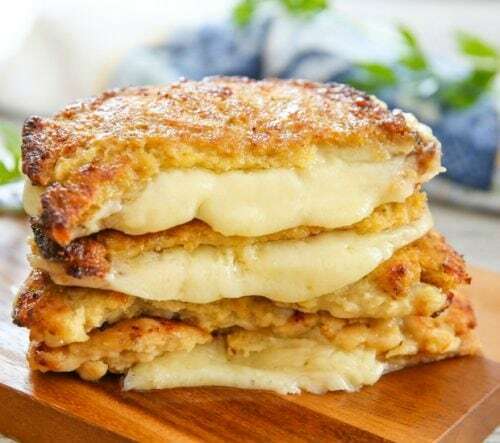 The recipe uses cheese in two different steps, which is why it is divided in the ingredients. 1/2 cup goes into the batter. Then another 1/2 cup is used for garnish. Hello! I was wondering if almond meal would be the same as using almond flour?? Thank you! Looking forward to making these, ASAP! almond meal is not as finely ground as almond flour so it will be a grittier texture. 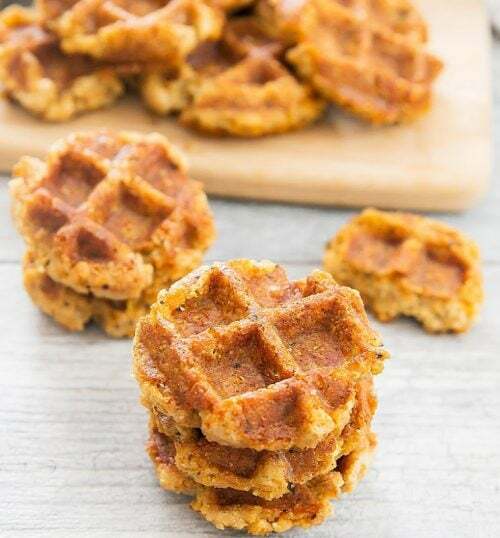 These are delicious and so easy!! I brought a couple to work with me and let 2 of my colleagues taste them and we all agreed that this was the best cauliflower recipe so far!! Love Love Love how easy it all came together. I f you do not have a food processor can you use the frozen Cauliflower Rice? Tried this with coconut flour using 3 tbsp flour. Had to double the eggs and still seemed a bit dry although the cheesey bit on top saved it. Next time will try 1-2 tbsp and double the eggs. Hi Kirbie! Any idea how long these last? I’d like to try it for my meal prep. These store well both in fridge and freezer. The link in recipie references large muffin liners, but the pictures of the finished product seem to be mini-muffins. Has anyone tried using both sizes of muffin tins? I’m guessing that the mini-size might need less cooking time. the finished product used full size muffin tin. Keep in mind they don’t fill the entire tin so they will be smaller than a full muffin. Has anyone tried these using a mini-muffin tin? I’m thinking of making these as an appetizer. I imagine the cooking time might be a bit less than a full size muffin.